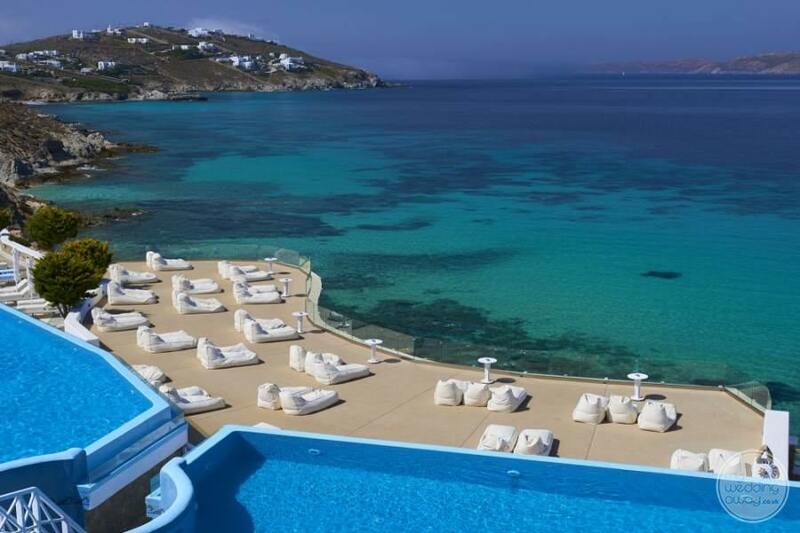 In our opinion, the Saint John Hotel is easily one of the best resorts on Mykonos. 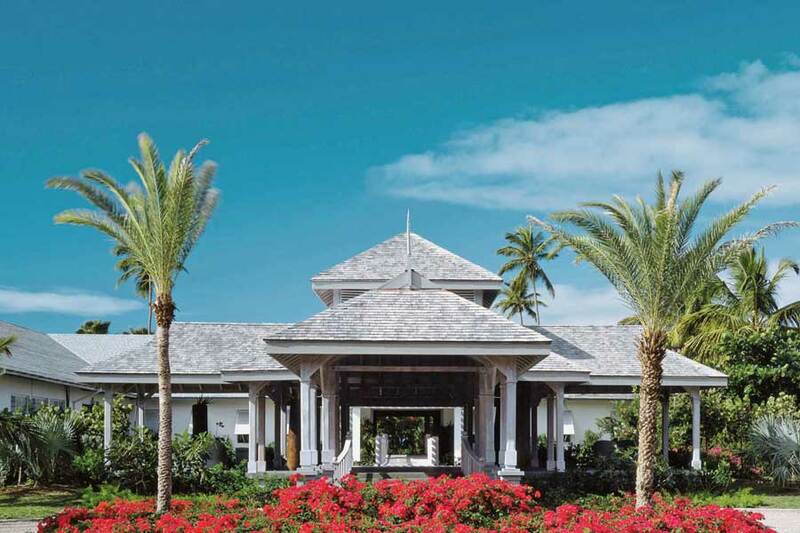 This idyllic oasis combines chic architecture, elegant interiors and luxurious amenities. Furthermore, its reputation for gracious hospitality, impeccable service and magnificent cuisine is renowned. As such, guests return time and time again. 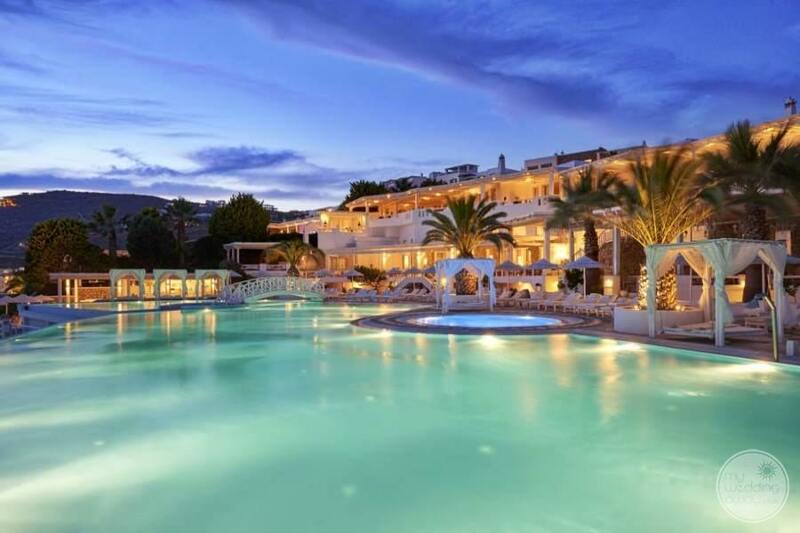 Situated in lovely Agios Ionnis, your first glimpse of the Saint John Hotel will take your breath away. 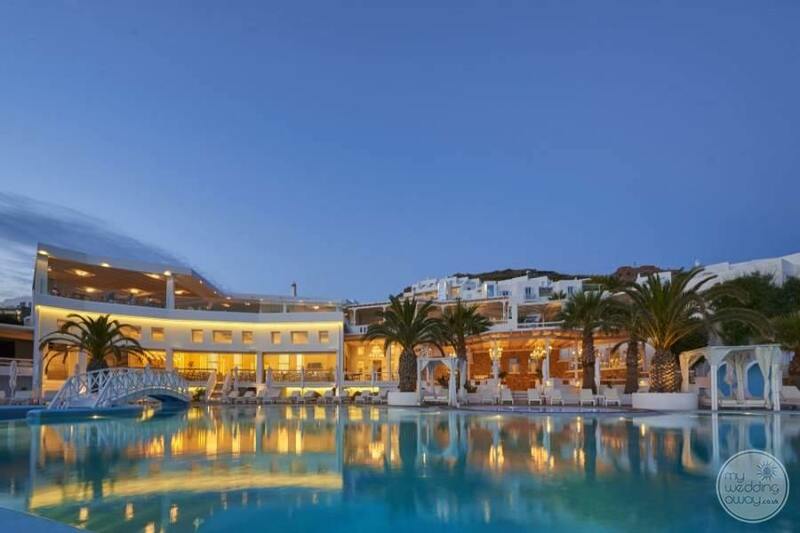 The bright white of the hotel against the blue of the sky is something to behold. 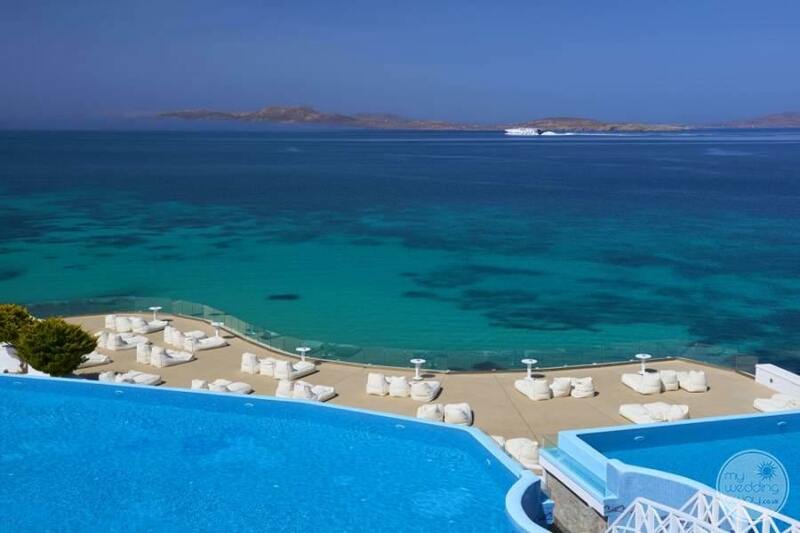 From its elevated position, the resort overlooks an expanse of pristine sand and crystal clear sea. 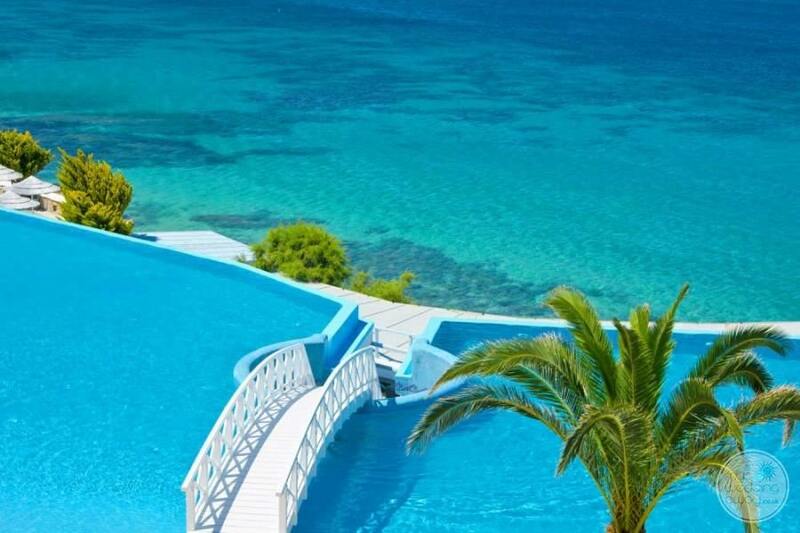 This is where the movie ‘Shirley Valentine’ was filmed and you’d be hard pushed to find anywhere more romantic to host your Greek destination wedding. 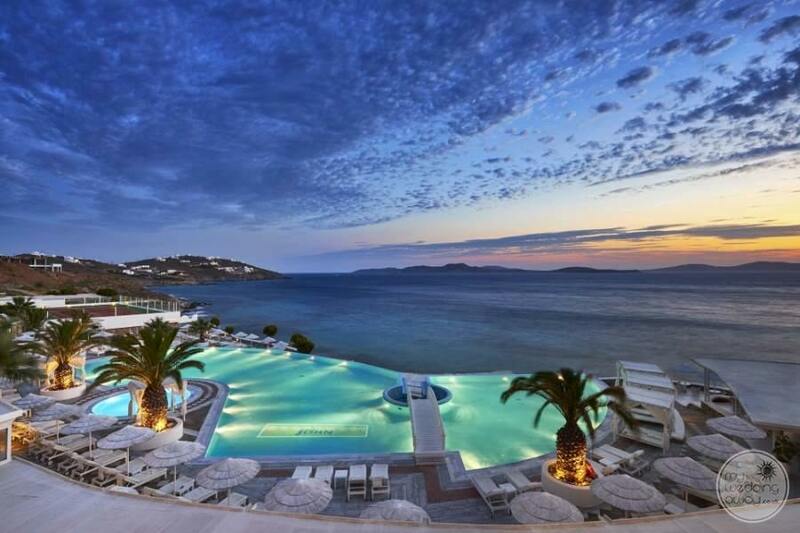 As a world-class resort, the Saint John Mykonos Hotel offers an array of amenities to cater to the desires of every guest. In addition to the infinity pool and spacious terraces, the resort boasts a fully equipped fitness centre, tennis courts and decadent spa. Meanwhile, those travelling with children will appreciate the children’s pool and playroom. Guests seeking a little exclusivity might like to add chauffeured limousine transfers or a private island tour. 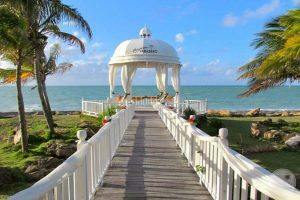 Furthermore, wedding couples may enjoy a romantic meal, prepared in your villa by your very own chef. Dining at Saint John is a real treat! 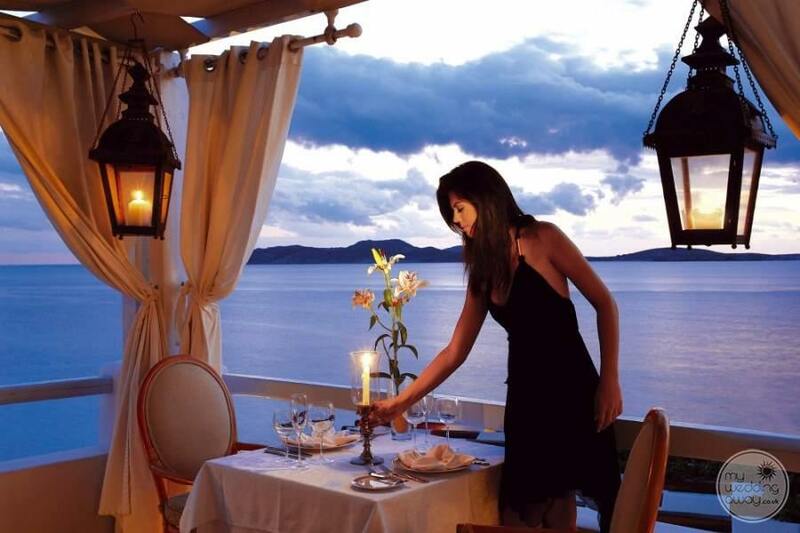 Choose from three wonderful restaurants, each boasting spectacular views. For example, ‘Kalimera’ is a great choice to start the day. Its aura of warmth and friendliness provides a delightful setting for diners. Operating throughout the day, it serves an extensive range of meals, snacks and refreshments. While ‘Symposium’ offers an elegant setting with bamboo and rattan furniture. 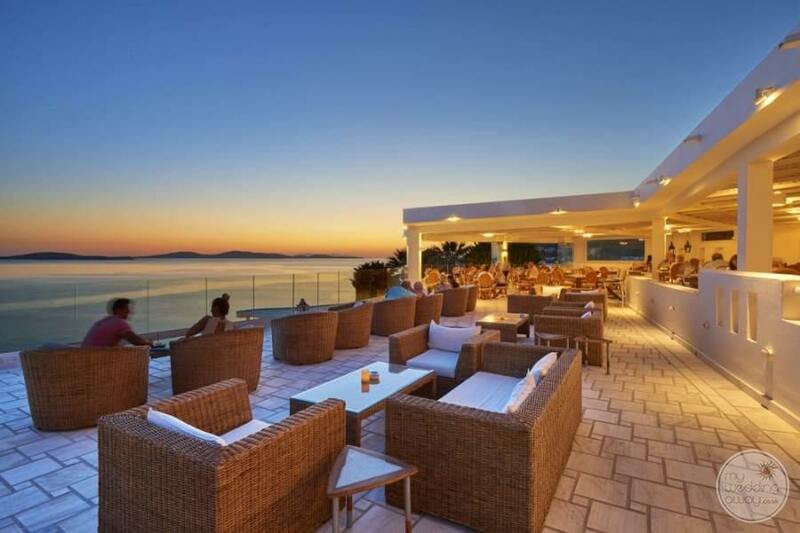 Here, guests can sample a wonderful selection of Greek and international dishes, all prepared with fresh local ingredients by the hotel’s creative culinary team. 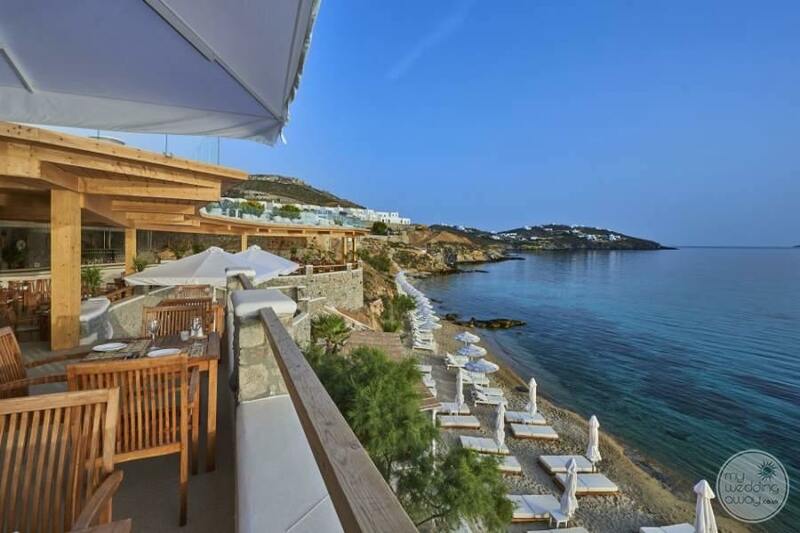 Last but by no means least, ‘Ilios’ boasts alfresco dining under the stars. Afterwards, retire to one of the two lovely bars. The deluxe accommodation at the Saint John Hotel includes luxuriously appointed and exquisitely furnished rooms, suites and villas. 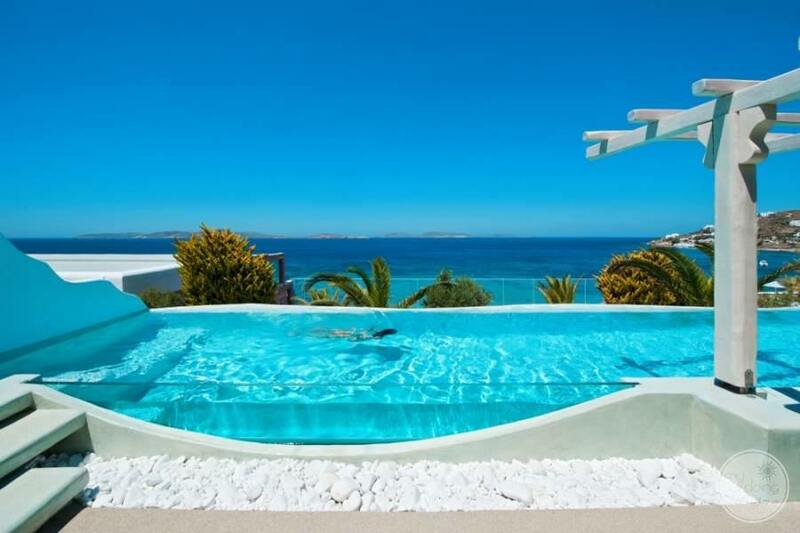 All offer a good degree of intimacy, fabulous views and helpful amenities. 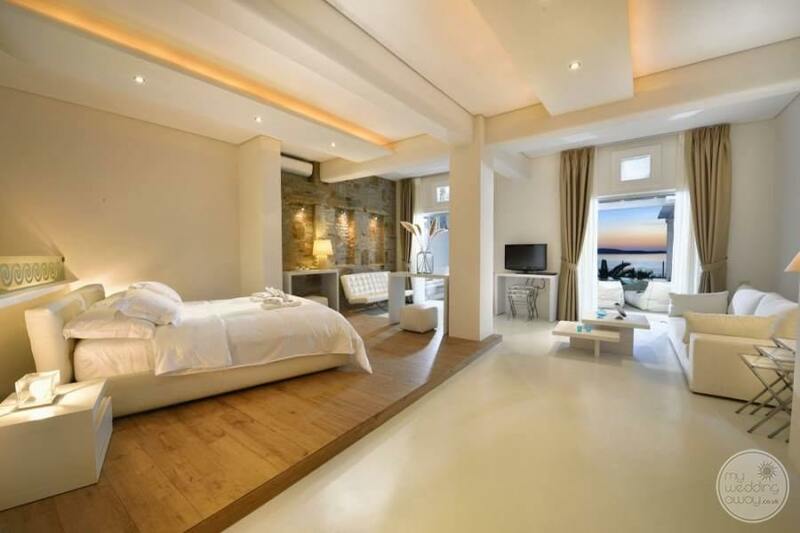 So stylish are the rooms, there’s really no need to upgrade. 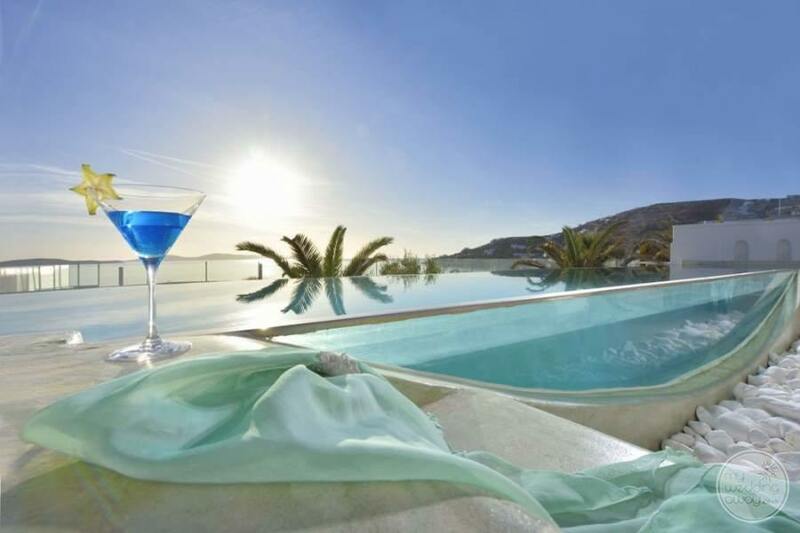 However, guests looking for the utmost in exclusivity and pampering will love Saint John Villas with their own private pools, sumptuous loungers and unrivalled views of the Aegean Sea. 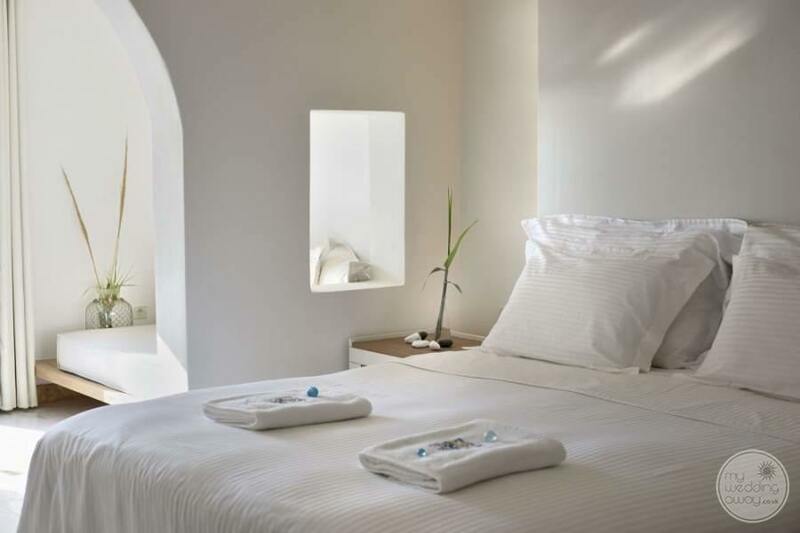 Located within the Saint John Mykonos Hotel Resort is a private white-washed chapel. ‘Agia Fotini’ is a truly idyllic setting for couples to exchange their vows and creates the perfect backdrop for a dream destination wedding. The team of professional staff understand the importance of a bespoke experience. 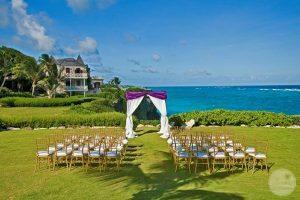 As such, whether you are seeking an intimate gathering or a more lavish affair, you’ll be in great hands.